This Lamb Neck Stew turned out even better than I expected! It was Comfort Food Supreme for a chilly February night. It made two generous servings, but I saved a tiny bit that I savored for breakfast the next morning. I know one of the reasons it was so good is because I used top-quality lamb, a gift from our good friends in California. Mike and Liz raise sheep on their Southern Cross Ranch. Their lamb is, without a doubt, the best I have ever tasted! The last time we visited, they generously sent us home with a few pieces to put in our freezer! One of the pieces was lamb neck. 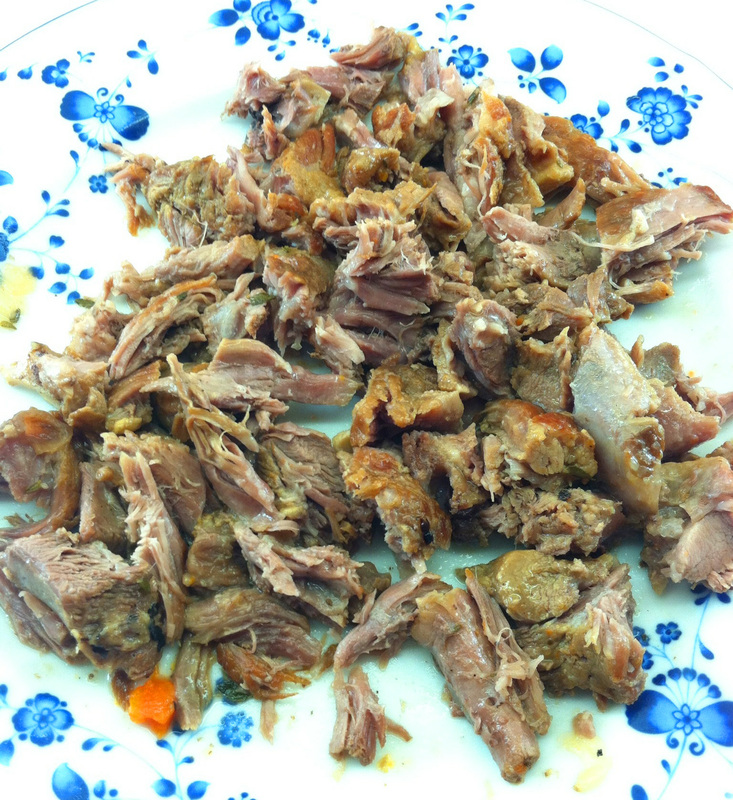 I had never seen lamb neck in the store* and I didn’t really know how to prepare it. 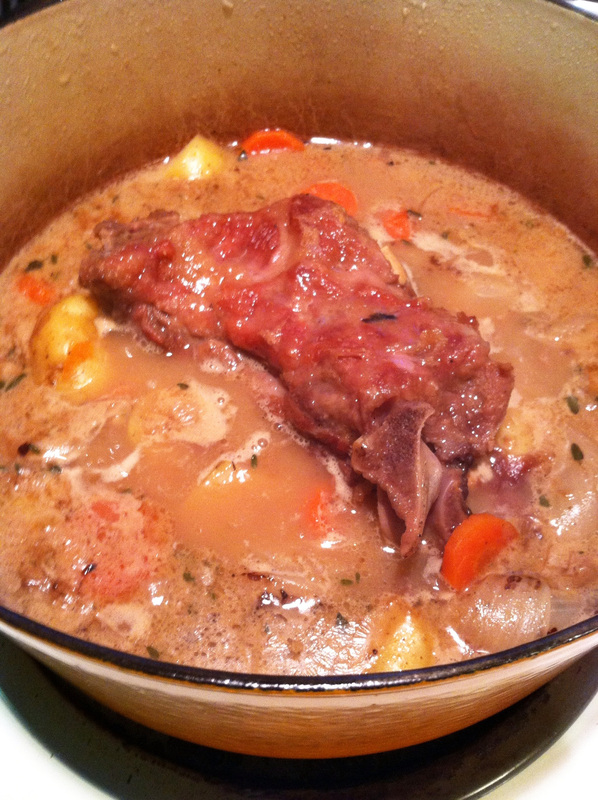 Searching the Internet, I learned that lamb neck is well suited for slow braising, making it perfect for stew. 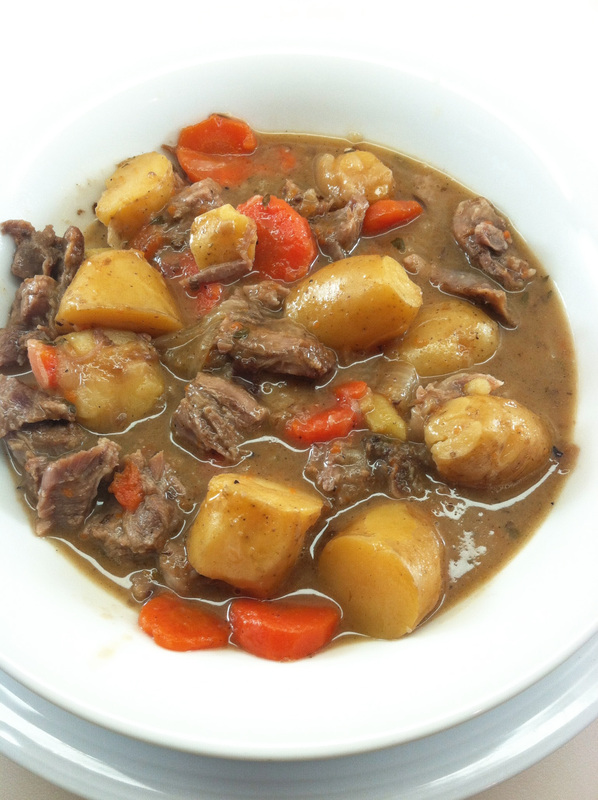 I found a recipe from a woman in Australia for Lamb Neck Stew. Mike is Australian, so this seemed like a fitting recipe for his lamb! I didn’t plan to blog this one, so I just snapped some quick iPhone photos which don’t do it justice. It was so tasty, though; I just had to share! If you can’t find lamb neck, you could try substituting lamb shanks or a shoulder cut. 2. Dust the lamb neck with the flour and cook it in the hot oil until it is lightly browned. Remove the meat from the pot. 3. Add the onion to the pot and cook, stirring, for 3 – 4 minutes until it is starting to soften. 4. Add the carrot and potatoes. Season with a bit of salt and pepper. Stir and cook for an additional minute or two. 5. Stir the Worcestershire sauce into the chicken broth and pour into the pot. Add the thyme and stir. 6. Put the lamb back into the pot, cover, and simmer over very low heat for about 2½ hours or until the meat is very tender. (I had to set my stove to the lowest heat possible to keep the stew at a simmer – with just a few gentle bubbles appearing at a slow rate.) I set the cover ajar for the last hour to help the stew thicken. 7. 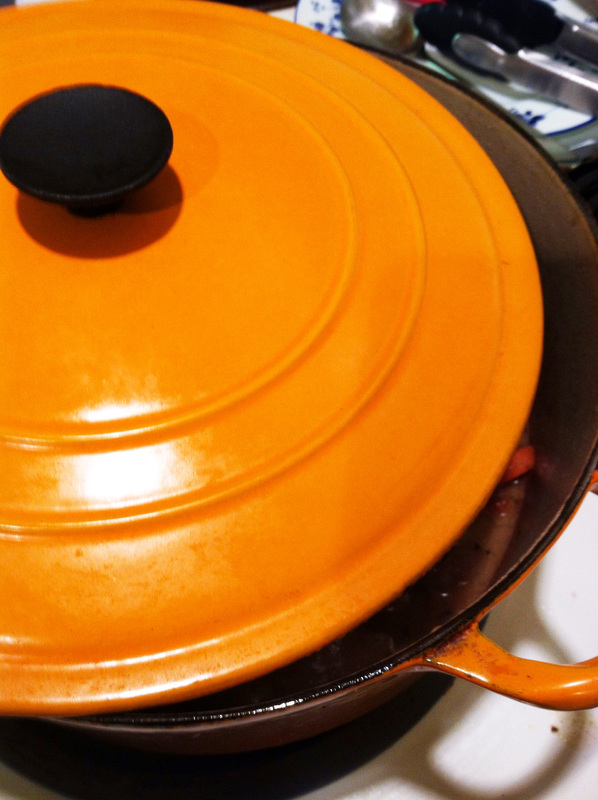 When the lamb is tender, take the meat out of the pot and remove the lamb from the bones. Cut, or shred the meat into bite-sized pieces and return to the pot. 8. Taste and season with salt and pepper if necessary. Remove the thyme sprigs and serve. Thank you so much, Abraham! would you not like to participate on the even that is running on my blog now..
My goodness, look how flavorful that bowl is! I could use some today….would warm me right up! Thank you for sharing such a unique recipe. I never, ever thought I would see a lamb neck recipe on an American blog! As an Aussie we grew up on this type of food, my mother grew up during the depression and learned to make tasty meals from the cheaper cuts of meat and I still cook a lot of it today. Great blog, so glad I found it. Thank you so much, Tricia! 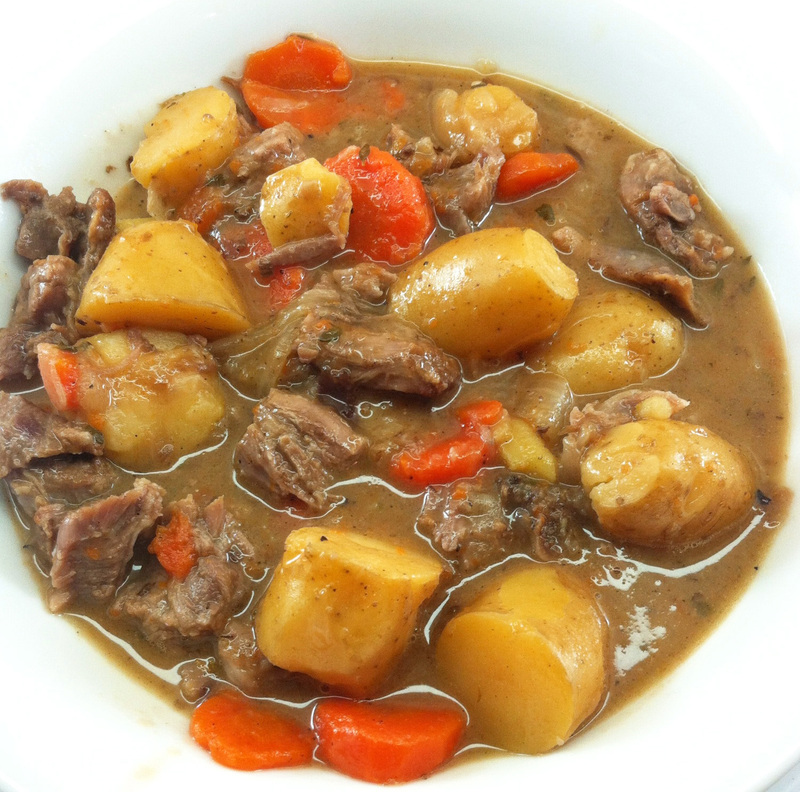 Lamb neck is really wonderful and I was excited to see that one of my local grocery stores carries it so I will definitely be making this stew again. So funny. I just saw grass fed lamb necks half off at Safe way and was going to give to my dog. Then I started reading how delicious they are and I’m going to try your recipe tomorrow. I never saw them before in the store. And since I live in NoCalifornia I’ll Google your friends lamb biz. I’m always on the lookout for localsome and would be nice to support local when I can. It is a shame we Americans do not eat much lamb because that makes it hard to find, as well as expensive. I am so glad Safeway not only carries lamb but also home delivers in Tucson. I have no car. I have always bought lamb chops, lamb shanks, lamb stew meat, ground lamb, and of course leg of lamb and only just recently found out about lamb neck slices. Your recipe does not have many ingredients which is fine with me although I will be making a larger one with 3 pounds of lamb as I like leftovers. just might add a bit of Guinness stout to the broth, though.